OAKLAND — KTVU (Channel 2), the Bay Area’s Fox affiliate, issued the following on-air apology on Friday. 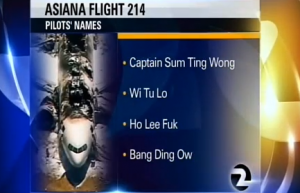 On Friday, July 12, during the KTVU Channel 2 noon newscast, we misidentified the pilots in the Asiana Airlines crash. We made several mistakes when we received this information. First, we never read the names out loud, phonetically sounding them out. Then, during our phone call to the NTSB where the person confirmed the spellings of the names, we never asked that person to give us their position with the agency. We heard this person verify the information without questioning who they were and then rushed the names on our noon newscast. Even with this statement from the NTSB, KTVU accepts full responsibility for this mistake. We issued an apology later in the noon newscast, and we also apologized on our website and on our social media sites. We have a lot of good people here at KTVU Channel 2. We pride ourselves on getting it right and having the highest of standards and integrity. Clearly, on Friday, that didn’t happen. So again, from everyone here at KTVU, we offer our sincerest apology. Paul Cheung, national president of the Asian American Journalists Association, and Bobby Caina Calvan, AAJA Mediawatch officer, issued the following statement on Friday. “KTVU touted itself as the leading source for accurate coverage of last Saturday’s Asiana crash. That boast took a major hit Friday when the station fell victim to a hoax that made a mockery of the tragedy and offended many loyal viewers. “During its Friday noon newscast, the station reported that it had learned the names of the four pilots in the cockpit of the ill-fated flight, which crashed at San Francisco International Airport on July 6 and killed three passengers. “Those names were not only wrong, but so grossly offensive that it’s hard for us at the Asian American Journalists Association to fathom how those names made it on the broadcast. We choose not to repeat those names. “Some could argue that it wasn’t entirely KTVU’s fault. The station said it had confirmed the names with a phone call to the National Transportation Safety Board, which is investigating the crash. “Despite the NTSB’s apology, KTVU is hardly off the hook. “‘It doesn’t make things right,’ Lee Rosenthal, KTVU’s news director, conceded during a chat with MediaWatch Friday evening. Rosenthal acknowledged lapses in the reporting process. Questions that should have been asked weren’t, he said. “‘We can assure you that none of this was premeditated nor was there any malicious intent in any way,’ Rosenthal said. “With such a vaunted reputation among local news stations, we expected much more from KTVU. We fail to understand how those obviously phony names could escape detection before appearing on the broadcast and were spoken by the news anchor. We urge KTVU to conduct a thorough review to prevent similar lapses. “AAJA is embarrassed for the anchor of the noon broadcast, who was as much a victim as KTVU’s viewers and KTVU’s hard-working staff, including the journalists who produced stellar work covering the crash. AsAm News reported Monday that the phony names have been “floating around the Internet at least two days” before the KTVU broadcast. “It is with deep disappointment and sadness that I write this letter. I am currently in Manila, Philippines where for the past week I have watched with pride the professionalism and enterprise of KTVU in covering the Asiana Airlines crash. I was crowing to people here about how I worked at that station. “Now, I am trying to defend the station over the airing of prank pilots’ names. “I hope that you will make every effort to tell the public the complete story about how this happened. I make no judgments and I understand that a NTSB summer intern confirmed the names, but common sense indicates that simply sounding out the names would have raised red flags. The correct journalism practice still calls for two confirmations of a story. “As you know, I have represented KTVU for years in my work for the Asian American Journalists Association. I am deeply indebted to the station and the Cox Media Group for the support it has given in the area of workplace diversity and racial awareness. None of what has happened erases that or the quality of work of KTVU and a commitment to racial equality. “But, it does point out that we all need to work harder at the craft of journalism and educating ourselves to sensitivities. In the end it only results in our ultimate mission…to provide truth. KTVU’s has several Asian American reporters/anchors — including John Sasaki, Claudine Wong, Rosy Chu, Robert Handa, Jana Katsuyama and Amber Lee — none of whom was involved in last week’s error.